This July, the 8th Philippine Business and Entrepreneur's Expo has invited social media professionals to share with you the basics of how to use Facebook, Instagram, YouTube and Blogging as a way to communicate your business to everyone. 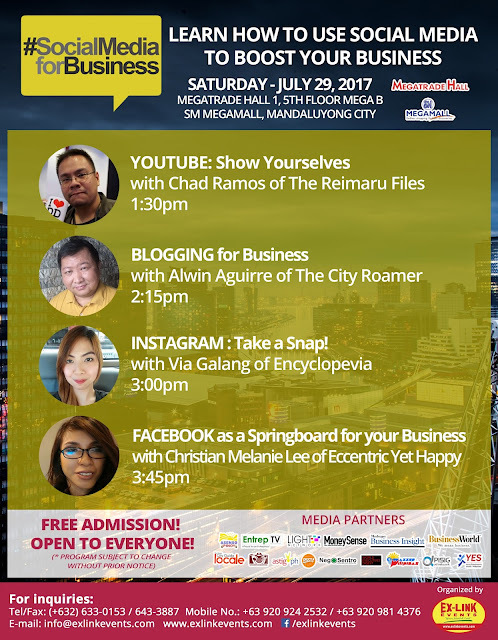 On the #SocialMedia for Business Seminar (to be held on Saturday, July 29), we are featuring The City Roamer’s Alwin Aguirre, The Reimaru Files’ Chad Ramos, Encyclopevia’s Via Galang and Social Media Influencer Christian Melanie Lee as they share their experience and expertise in the fields of Blogging, YouTube, Instagram and Facebook and to give you tips on how each platform can help you boost your business. The 8th Philippine Business and Entrepreneurs' Expo will be held at the Megatrade Hall 1 of SM Megamall in Mandaluyong City this July 28 to 30, Friday to Sunday. We are open for exhibitors to showcase their products and services - get in touch with Ex-Link at (+63 2) 633-0153, 643-3887 or 535-1150; SMS (+63) 920 981 4376 or (+63) 920 924 2532; email info@exlinkevents.com or message us on Facebook @exlinkevents. Program lineup subject to change without prior notice.